Rhizomes with 2 scales at each node. Erect stem apparent, scales 2, near middle. Leaves in pseudowhorl at apex of erect stem, 10--30 ´ 3--6 mm; blade linear-oblong to oblong, base cuneate, margins serrulate, apex obtuse to apiculate. Inflorescences: spathes 1-flowered. Flowers unisexual, staminate and pistillate on different plants; staminate flowers unknown; pistillate flowers sessile to nearly sessile, ca. 4 mm. Fruits beaked. Seeds 0.3 mm. Flowering spring. Sandy to coral substrates of marine waters; -40--0 m; Fla., La., Tex. ; West Indies (Cuba, Bahama Islands). Other References Allen, G. E. 1976. Investigations and current status of insect enemies as biological control agents of aquatic weeds. In: C. K. Varshney and J. Rzóska, eds. 1976. Aquatic Weeds in South East Asia. The Hague. Pp. 299--306. Austin, D. F. 1978. 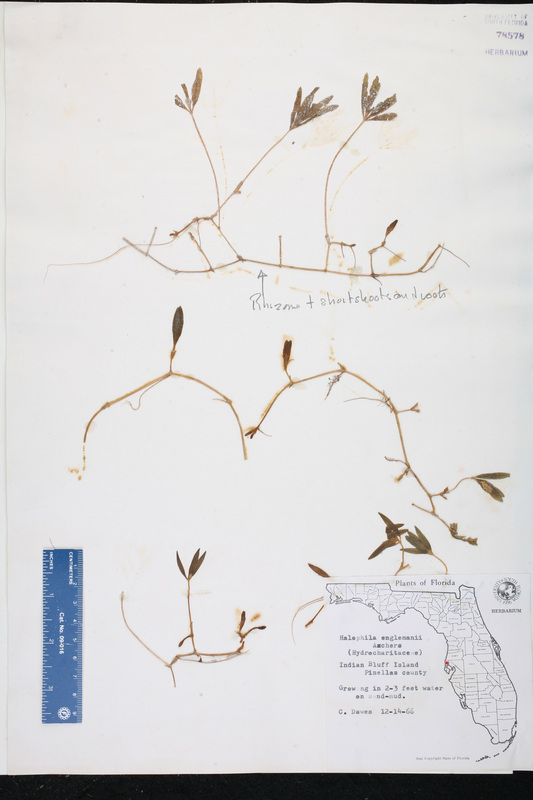 Exotic plants and their effects in southeastern Florida. Environm. Conservation 5: 25--34. Davenport, L. J. 1980. In: IOPB chromosome number reports LXVII. Taxon 29: 347--367. Gadella, T. W. J. and E. Kliphuis. 1973. Chromosome numbers of flowering plants in The Netherlands. VI. Proc. K. Ned. Acad. Wet., Ser. C, 76: 303--311. Tarver, D. P. et al. 1978. Aquatic and Wetland Plants of Florida. Tallahassee.